Do you have a minute to spare to learn some English? 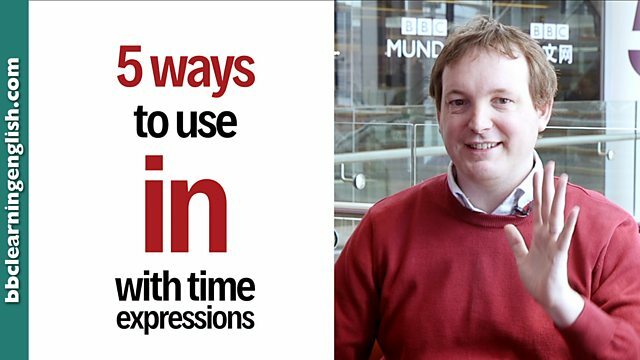 Here's Phil to fill you in on five ways to use in with time expressions! Give us 60 seconds and we'll give you the English! Hi, I'm Phil from BBC Learning English. Today, I'm going to tell you five ways to use in with time expressions. Number one: months. I can say: I'm going on holiday in May. Number two: seasons. So, we can say: In winter, it's cold. Number three: years. So, I can say: I finished school in 2000. Number four: most times of day. I leave home in the morning. I get home in the evening. But, I go to sleep at night. It's an exception! Number five. We use it with in the past, in the present and in the future. In the future, you'll learn everything from videos. I'm going on holiday in May. I'll next see you at Christmas in December. I think we arrived some time in June. I think this year I'll have my holiday in summer. Mummy, do the leaves fall off the tree in spring or in autumn? I finished school in 2000. I grew up in the 1930s. I'll see you in the afternoon. In the past, people died much younger. You need to learn to live in the present. Which time of day is the exception to using 'in'? If you are unsure, have a look back at the information above. Which of the following do we NOT use 'in' with? Do we use in with all seasons or is one different? Which season do we not use 'in' with?